Government employee compensation is a recurring issue in the public policy arena. 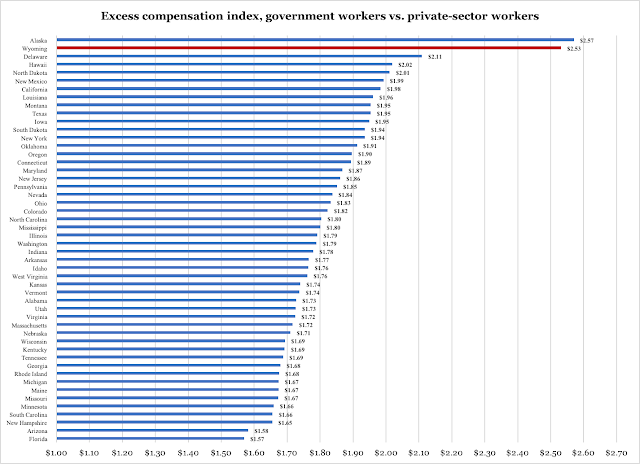 Since my response yesterday to a reader question about the compensation of employees in government and the private sector, I have received another question about the broader relationship between government employee compensation and government productivity. Since the measurement of government productivity is technically complex - not complicated - and therefore time consuming, for the purposes of this blog I have to restrict myself to a more basic measurement: the relationship of value production to employee compensation. 3. Wyoming stands out again (surprised?). To measure the value contribution from government and the private sector, we need a "common denominator", a yardstick that is fair to both sectors. The best, and by far most established, such method of measurement is the Gross Domestic Product. With some lag, the Bureau of Economic Analysis produced GDP data for the states, broken down in fairly impressive detail by industry. For example, we can compare GDP produced by the private sector as a whole - or individual industries - to government as a whole, or broken down to state and local governments. Again, in three states the average government worker actually makes a bigger value contribution to the economy than the average private-sector worker. In Vermont they come out neck by neck. In the rest of the country, the value disparity gradually worsens until it is $0.62 in North Dakota. the value disparity, i.e., the ratio of a government worker's contribution to the economy to the private-sector worker's contribution. c) To obtain the actual excess compensation value, we now divide $1.80 - the pay disparity - by $0.71, the value disparity. The pay-value disparity in government employee compensation comes out to $2.52 in Wyoming. What does this mean? Not too much at the individual level; in the aggregate, however, it means that if we, here in Wyoming, paid our government employees according to what they contribute to the economy, on average we would have to adjust their payment down from $2.52 per $1.00 earned by a private-sector employee, to a $1.00 to $1.00 parity. Basically, this means - again on average - a 60-percent reduction of the average compensation in government. Let me make clear, right off the bat, that I am not advocating such a drastic cut in pay for anyone, not even for those who hold the most artificially created school-bureaucracy jobs. Instead, what we can derive from this is that we have a total excess cost of our government workforce that, by this method, amounts to about 152 percent. If we understand these numbers as policy indicators, more than verdicts over the work done by individual government workers, we get a more accurate understanding for what information they convey. Bluntly: we have some serious downsizing to do of our government. By doing it intelligently we can both increase the value produced in our economy and protect the most vulnerable among our fellow citizens against undue hardship. The way this excess compensation ratio is calculated, there is no inherent bias against government. In fact, if a government worker contributes, say, $1.20 worth of value for every $1.00 a private employee contributes, and if that government worker is compensated at a similar ratio, then there is no excess compensation in his earnings. The same holds true, obviously, if the pay and value ratios are, say, $0.75 per $1.00 in private earnings. 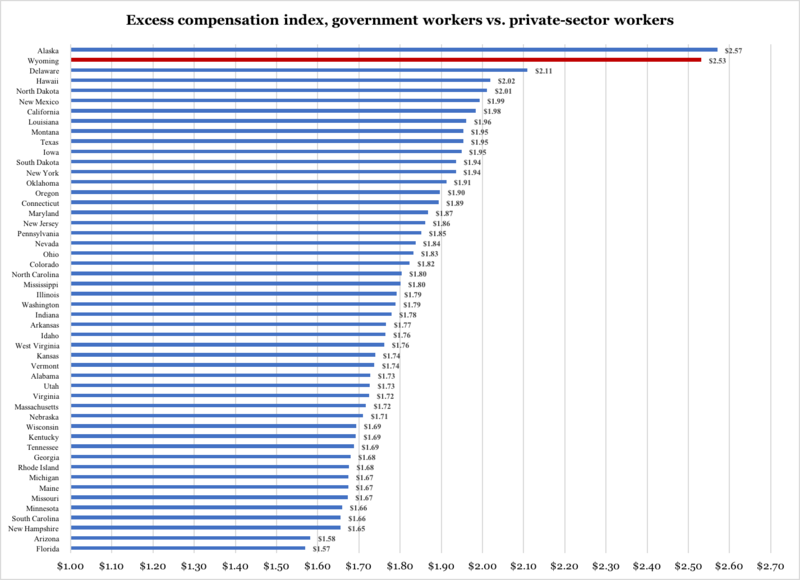 The problem here is not the contribution of government per se, but the fact that government employees, on average, receive excessive compensation. The best way to rectify that is to downsize government, privatize what the private sector does best, and to secure the financial future of government's core functions: the protection of life, liberty and property. *) The GDP numbers used here are, as mentioned, from 2015. They are also devoid of inflation, as they are calculated based on 2009 prices. The reason for removing inflation is that it tends to make government look worse; alas, removing inflation makes government look a little bit better than it otherwise would.